At its core, the HTC U12 Plus is a solid high-end smartphone. It's fast and powerful, has a great screen, impressive camera, and HTC is actually trying to innovate with Edge Sense. If you're an HTC fan, you'll love the U12 Plus. The problem is, this phone doesn't surpass the competition in any one area. And of the things that the U12 Plus gets right, its competition also gets those things right. There's just no standout reason to buy this phone over the Pixel 2 XL, Galaxy S9 Plus, or even LG's G7 ThinQ. This is a good phone marred by a lackluster software experience, terrible buttons, and price tag that's too high. If you can get past those things, buy it. I don't think you'll regret it. For most people though, I'd say it's safe to pass on the U12 Plus. The HTC U11 surprised us last year with its superb camera and snappy software, and the HTC U12 Plus continues that trend. The company’s new 2018 flagship offers a near-complete package likely to impress HTC enthusiasts and skeptics alike, but I don’t know if I can actually recommend this phone to many people. Find out why in our full HTC U12 Plus review. 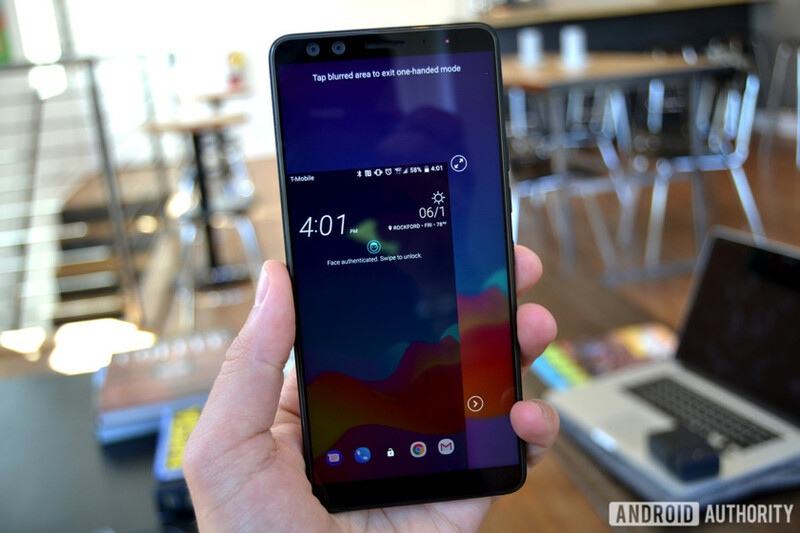 HTC U12 Plus review notes: I have been using the HTC U12 Plus on T-Mobile’s network in the U.S. for eight days. Our review unit is running Android 8.0 Oreo and software number 1.15.617.4 on the March 1, 2018 security patch. We’re holding off on adding review scores until we can put the U12 Plus through our full suite of tests. The U12 Plus used in this review was provided to Android Authority by HTC. 2018 seems to have become a year of iteration, and the HTC U12 Plus fits right into that theme. We’re not getting a drastic redesign from the U11 or U11 Plus, but rather a refined take on the Liquid Surface design introduced last year. Those familiar with the U11 will appreciate the minimal bezels on the front, as well as the taller 18:9 screen. There’s no notch on the display either, which is a nice departure from all the other phones that include a notch in 2018. Like its predecessors, the U12 Plus features an all-glass design and an aluminum frame. It’s heavy, weighing in at 188 grams, and feels like a really high-quality piece of tech. That’s par for the course for an HTC phone, though. Another thing to expect when you buy HTC is superb design, and the U12 Plus is no exception. This is one of the coolest looking phones I’ve ever seen. I don’t think it’s as elegant as the Galaxy S9 or as minimal as the Essential Phone, but there’s something about the way HTC designs phones that makes them stand out. I’ve actually caught myself staring at the back of this phone for no particular reason. This is one of the most eye-catching smartphones on the market right now. It comes in three color options — translucent blue, flame red, and ceramic (or titanium) black. They all look great, though the blue option will probably be the most popular. A couple notes on some of the design elements: the ceramic black model is just a color name — it’s not actually made of ceramic. All three color variants are covered in a custom layer of Gorilla Glass on the front and back that’s closer to Gorilla Glass 3 than the newer Gorilla Glass 5. HTC said it used this type of glass because it provides strong shatter and scratch resistance, while still allowing the company to manipulate it at extreme angles so the phone is comfortable to hold. Like other glass phones, the U12 Plus is slippery. You’ll want to throw a case on it to avoid accidental drops. HTC has some of the best phone designers in the business, which is why it’s shocking that the side buttons on this phone are so bad. The power and volume keys aren’t actually buttons, they’re pressure-sensitive areas on the side that activate when pressed down. Think of them like a continuation of Edge Sense, but for individual buttons. The new buttons are by far the worst part of this phone. This is by far the worst part of this phone. Since you don’t get that physical click out of the side buttons — only a bit of haptic feedback — there’s some noticeable lag when turning on the screen or adjusting the volume. Trying to click any of the side buttons in rapid succession is damn near impossible, which makes it difficult to do simple things like turn down the volume or double-tap the power key to launch the camera. They also require a harder press than you’d normally have to apply to any other phone’s buttons. Whenever I use this phone, I genuinely try to avoid using the side buttons. They’re that frustrating. To end on a positive note, the lack of side buttons allowed HTC to more easily add an IP68 water resistance rating to the phone. That’s great news for anyone who’s ever spilled a drink on their phone or dropped it in the toilet. Despite where the market is headed, HTC is still invested in LCD displays. The HTC U12 Plus comes with a 6.0-inch Super LCD 6 screen with an 18:9 aspect ratio and a Quad HD+ resolution. It’s bright, crisp, and offers great viewing angles. Plus, it gets dim enough for nighttime use and bright enough for outdoor use, so it looks like HTC really improved its display tech this time around. The default DCI-P3 color profile is a bit to saturated for my liking, but it’s easy enough to tweak in the settings menu. While the big, tall display is nice, HTC doesn’t allow you to swipe down on the fingerprint sensor to pull down the notification shade. This is a feature I use constantly on my Pixel 2 XL, and I really wish it was on the U12 Plus. 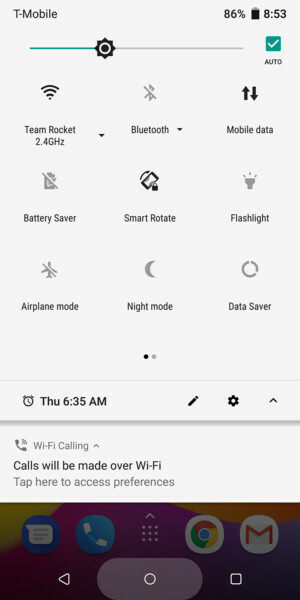 You can swipe down from anywhere on the home screen to see your notification shade, but it’s not as convenient as using the fingerprint sensor. HTC included an always-on display this time around, too. Called Smart Display, you can set this ambient screen to appear only when you wake your phone, or have it on at all times. Since the U12 Plus has an LCD display, this feature might use up a little extra battery if you keep it on. Outside of a Pixel or OnePlus phone, this is one of the smoothest Android experiences you’ll find. This shouldn’t come as a surprise, as the U11 and U11 Plus were two of the speediest Android phones of 2017. The HTC U12 Plus sports a Qualcomm Snapdragon 845 SoC clocked at 2.8GHz, backed by 6GB of RAM. No matter what you throw at this phone — multitasking, heavy gameplay, or just scrolling around the UI — the U12 Plus will handle it with ease. I only ran into one real performance issue throughout the review period. I had to restart the phone after it froze on me, but I’m actually glad that happened — it gave me the opportunity to test out whether or not the power button still works after the phone freezes. It does, which is very good news. 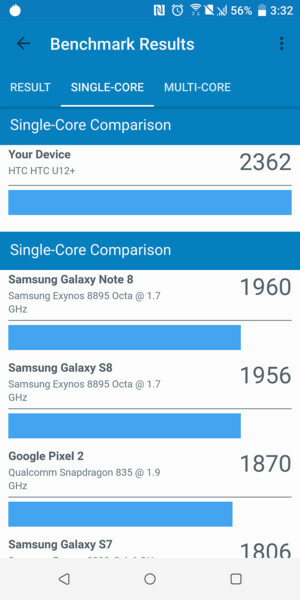 Geekbench 4 gave the HTC U12 Plus a single-core score of 2,362. In comparison, the OnePlus 6 scored 2,454, while the Galaxy S9 scored 2,144. The U12 Plus achieved a multi-core score of 8,910, while the OnePlus 6 scored 8,967, and the Galaxy S9 scored 8,116. AnTuTu gave the U12 Plus a score of 267,560, compared to the OnePlus 6’s 262,614 and the S9’s 266,559. Finally, the HTC U12 Plus scored 4,537 in 3D Mark, while the OnePlus 6 and Galaxy S9 scored 4,680 and 4,672, respectively. The base model HTC U12 Plus comes with 64GB of storage, and you can grab the 128GB model for just $50 more. It also has microSD expansion up to 2TB if you need even more room. HTC was one of the first manufactures to to ditch the headphone jack, so it’s no surprise that the U12 Plus doesn’t come with one either. This time around, HTC’s not providing a USB Type-C to headphone jack adapter in the box. You’ll have to buy one from the company’s website if you want to use your wired headphones. That’s pretty annoying. It comes with a free pair of HTC’s wonderful USonic earbuds, just like last year. These are actually really nice earphones — they can analyze and tune audio specifically for your ear, and they feature active noise cancelation. This is a great phone for audiophiles, despite the lack of a headphone jack. BoomSound speakers make their return on the U12 Plus, and they’re great. They get super loud — almost too loud sometimes — and sound quality is pretty clear. If you’re into listening via wireless audio, the U12 Plus supports Qualcomm aptX HD and Sony LDAC codecs for high-res 24-bit audio. Let’s talk biometrics. The U12 Plus’ rear-facing fingerprint sensor is one of the fastest I’ve ever used. It’s much quicker to unlock than the Pixel 2. I’d say it’s right up there with the speed of the OnePlus 6 or any recent Huawei phone. It’s 2018, so it’s no surprise to see HTC implement its own face unlock feature. It is very fast. Like, once you glance at the lock screen, it’ll unlock almost instantly. There’s even a “low light” mode to help the phone recognize your face at night, but that requires making the display glaringly bright — not something many people will like when lying in bed. And no, I haven’t been able to fool the face unlock feature with a photo of myself. The phone’s 3,500mAh cell should offer more than enough power for a full day’s use, but unfortunately that’s not the case. Most days I only get about three hours of screen-on time with a single charge, sometimes up to four hours. A couple hours of streaming podcasts or a few minutes of scrolling through Instagram drains battery much quicker than it should. That’s pretty atrocious by 2018 standards. Considering devices like the P20 Pro and Mate 10 Pro can achieve about seven or eight hours of screen-on time on a charge, HTC’s numbers aren’t anything to write home about. In terms of recent HTC devices, the U12 Plus’ battery is right in the middle. The U11 only came with a 3,000mAh unit, while the U11 Plus, despite its similar size to the U12 Plus, came with a 3,930mAh battery. The U12 Plus supports Qualcomm’s Quick Charge 4.0, though the included charger only supports Quick Charge 3.0. There’s also support for USB Power Delivery (PD). Despite its glass exterior, the HTC U12 Plus does not support wireless charging. Bummer. The U11 and U11 Plus were two of 2017’s best camera phones, and the U12 Plus might be a contender for 2018. It doesn’t rival the Pixel 2’s camera — basically the current benchmark for smartphone photography — but it gets really close. This time around, HTC included two rear-facing cameras — a primary 12MP wide-angle sensor with an ƒ/1.75 aperture and a 16MP telephoto lens with an ƒ/2.6 aperture. Both cameras have both OIS and EIS. The cameras can take astounding shots in well-lit areas, and very good shots in low-light settings. Low-light performance isn’t as good as the P20 Pro, but it is a step up from the U11. And that’s saying something! Note: The camera samples in this review are cropped. You can see all the full-res images at this Google Drive link. The rear cameras on the U12 Plus provide rich colors and tons of detail in most shots. If you’re buying this phone for the camera, you won’t be disappointed. Yet again, HTC made one of the best camera phones on the market. Let’s do a quick comparison with the U12 Plus, Pixel 2, and Galaxy S9. In the image below, you can see the Pixel 2’s photo on the left is a bit more saturated than the one from the U12 Plus. The U12 Plus took a great image, but the grass is a little greener, and the sidewalk in the back is darker and more true to life in the Pixel 2’s photo. The Galaxy S9’s photo on the left (below) is even brighter than the U12 Plus. Samsung’s camera brought out more of the highlights than both other phones. However, there doesn’t appear to be as many differences between these two photos as with the Pixel 2 comparison above. HTC is slowly but surely but surely adding more features to its camera app. There’s still a pro mode if you want more control over your photos, as well as panorama, hyperlapse, and slow motion video modes. The camera app itself is a bit laggier than the Galaxy S9 and Pixel 2, but only by milliseconds — it’s barely worth mentioning here. I ran into a weird performance issue quite frequently where the U12 Plus drastically changes the exposure level when focusing on a subject. If the sensors pick up too much light, the camera app will flicker and crush all the blacks almost immediately. There’s no smooth transition between a well-lit setting and a low-light setting. I’m hoping this issue can be fixed with a software update, because it’s extremely annoying. For what it’s worth, I couldn’t reproduce the issue on any other phone. The dual-camera setup allows the U12 Plus to take portrait shots with a bokeh effect, just like most other phones. There are two different ways to take bokeh shots: automatically or manually. Automatic bokeh shots snap a photo and have HTC’s camera app decide how much to blur the background, while manual bokeh mode lets you adjust a slider before you take the photo. You can also edit the amount of blur after the photo has been taken, too. Bokeh shots turn out okay for the most part, but only if there’s plenty of light surrounding your subject. The phone has edge detection issues just like most other devices, but I haven’t run into as many problems as I would have expected. Photos taken with portrait mode also lack color — more so than any other phone I’ve used. On the video front, the U12 Plus can shoot in 4K at up to 60fps, and shoot slow motion video in 1080p at 240fps. No, the U12 Plus doesn’t offer higher frame rates in slow motion like the Galaxy S9, but 1080p at 240fps should be fine for most people. Also making its return is Sonic Zoom (formerly known as Acoustic Focus), which lets you zoom in on a subject while shooting video to amplify the subject’s sound. It works really well, and HTC says it’s 60 percent louder and 33 percent more focused this time around. The U12 Plus has two 8MP front-facing camera sensors, each with an aperture of ƒ/2.0 and an 84-degree field of view. There’s no OIS with the front cameras though, so you’ll experience some shaky video if you tend to vlog with your phone. Selfies taken with the U12 Plus are generally good, though it can be hard to capture a clear photo if you’re not completely still. There’s also a beauty mode built into the camera app that lets you adjust your face for smoothness, brightness, eye size, and face structure. This mode is way too intense, even at the lowest setting. You’re better off just turning this off altogether. I ran into a few more inconsistencies with the portrait mode on the front-facing camera. The phone struggles to tell hair and the background apart much more often than with the rear-facing camera. You’ll just have to make sure you’re in a well-lit area if you want portrait mode to look good. Oh, and there are new AR stickers built into the camera app, which can be used with the front or rear cameras. There are some fun ones like dogs, pandas, or cats, but also some questionable ones. Feel free to preview the camera samples below, or view the full versions on Google Drive. If you’ve used HTC Sense in the past few years, you’ll already be familiar with the U12 Plus’ software experience. That would normally be a good thing — providing a consistent user experience over a range of devices for years on end — but I think Sense needs to change. It feels just like the software on the One M8, M9, 10, and U11. HTC Sense isn't bad, it's just stale. Plus, HTC doesn’t appear to have updated any of its own apps for years. The HTC Weather, Dialer, Messages, and Clock apps are all nearly unchanged from the versions that launched on the HTC 10 two years ago. The home screen is a bit different, but you still have the near-pointless BlinkFeed on the left that still only supports a handful of social media integrations. There’s also the HTC Sense Companion app, which attempts to give you restaurant recommendations, weather details, and a few other personalized suggestions based on where you are and what you’re doing. Sense Companion doesn’t show up all that often. When it does, it either recommends restaurants I’ve already been to, or it shows up at inopportune times. When you spend $800 on a phone, the last thing you should see are ads in the software. The device runs Android 8.0 Oreo out of the box, not the newer Android 8.1, which has already been out for almost six months. We’re not sure why the company isn’t launching its phone with the latest version of Android, but it doesn’t give us confidence that Android P will arrive in a timely manner. The big new software feature on the U12 Plus is Edge Sense 2, an updated version of that “squeeze thing” that launched on the U11. This is one of the best parts of the phone. There are three new additions to Edge Sense this time around: smart rotate, smart dim, and a new double-tap gesture. Smart rotate will come in handy when you’re lying in bed looking at your phone. When the U12 Plus senses you’re holding it in portrait mode, a slight tip of the device will no longer accidentally trigger auto-rotate. This actually comes in handy quite often. Smart dim is one of those set-it-and-forget-it features. When you’re holding the U12 Plus, the screen won’t dim even if the screen timeout is up. Finally, you can now double-tap either side of the phone to perform a specific action. By default, a double-tap will trigger one-handed mode, which shrinks the screen to a much more manageable size. You can set the double-tap gesture to pretty much anything, though — it can launch your favorite apps, go back, launch a floating navigation bar, or trigger your default voice assistant. Double-tapping the side of the phone is nice and all, but I don’t think it’s a feature many people will use in the long run. Since this phone is glass, slippery, and will probably crack if you drop it, you’ll need to buy a case for your U12 Plus. You won’t be able to use the double-tap gesture if you get a case that protects all edges of this phone. Of course, all the other wonderful squeezy features have returned. A short or long-squeeze can launch any app of your choice, control music playback, launch the Edge Launcher, expand or collapse your notification shade, and more. I set my short squeeze to launch Google Assistant (I got used to it on my Pixel 2), and a long-squeeze launches the camera app (since it’s too hard to double-tap the power button). Amazon Alexa integration is here too, for those who aren’t fans of Google Assistant. We’d also recommend downloading the Edge Sense Plus app for even more customization. The HTC U12 Plus is available for pre-order at HTC.com and Amazon for $799 and $849 for the 64 and 128GB models, respectively. Pre-orders will ship out sometime in June. HTC also offers financing options on its website if you don’t want to shell out $800 all at once. It’s not available through any carrier partners, and no retailers are carrying it in the U.S. That means you can’t buy this phone in brick-and-mortar stores. That’s a shame for consumers, and will result in tons of missed sales for HTC. $800 is a lot of money for any phone — especially this one. It’s $150 more than the U11 was at launch. I don’t think it really offers enough for that increase. It’s also more expensive than the Google Pixel 2, and not too far off from the Samsung Galaxy S9 Plus. Of course, there are plenty of reasons to buy it. At its core, this is a solid high-end smartphone. It’s fast and powerful, has a great screen, an impressive camera, and HTC is actually trying to innovate with Edge Sense. It’s also one of the only high-end phones without a notch, if you care about that sort of thing. If you’re an HTC fan, you’ll love the U12 Plus. The U12 Plus is a great phone that doesn't surpass the competition in any meaningful ways. The problem is, this phone doesn’t surpass the competition in any area. What the U12 Plus gets right, its competition also gets right. There’s just no standout reason to buy this phone over the Pixel 2 XL, Galaxy S9 Plus, or even the LG G7 ThinQ. This is a good phone marred by a lackluster software experience, terrible buttons, below average battery life, and a price tag that’s too high. If you can get past those things, buy it. I don’t think you’ll regret it. For most people, I’d say it’s safe to pass on the U12 Plus. What are your thoughts on the HTC U12 Plus? Have you ordered one? Let us know your thoughts in the comments.